There are many subjects about Belfast that I could have decided to write a novel about – and I might well have done so if I didn’t have a brain that comes up with scenarios invariably containing aliens or elves, or all things spooky. 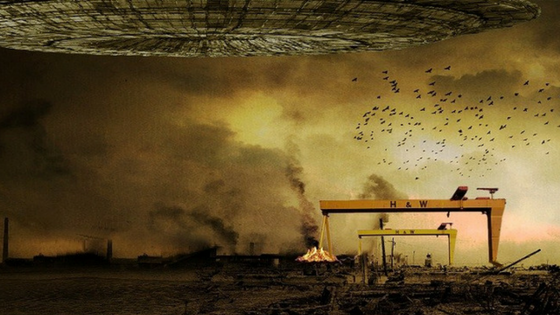 Perhaps unsurprisingly, therefore, when I looked down the lough to Belfast and started wondering what sort of story I would set there, a simple question, which became the answer, came to mind: What would happen if aliens invaded Belfast? Now, I was just starting to take my writing seriously at this stage, so I decided to research the market. I quickly learned that there aren’t that many science fiction books that used Belfast, or Northern Ireland, as their setting. (There are a few – Ian McDonald has in the past, and Mark Lynch uses the Northern Irish setting in his novels). And that irked me. Belfast is a great setting for a science fiction novel. It’s compact, so you can wreak lots of havoc easily, it’s already a pretty gritty looking city in places, and it’s ringed by hills which gives a fabulously claustrophobic feel. So, despite my research throwing up that it might not be the easiest sell in the world, I decided to write the book. So, why didn’t I want to write about the Troubles? In fact, why not use the invasion as some sort of analogy? That’s one of the strengths of science fiction, after all – it can shine a new light on the world we know. Why not the world of Belfast? And since I have two sets of aliens, it would have been an easy thing to tweak them to mean something more relevant to Northern Ireland. Well, truth be told, I’m not a political animal. I don’t think I have a lot to offer anyone in terms of new knowledge about our past. In fact, I’d quite like books about Northern Ireland not to be about the Troubles as much as they often are. But it was about more than that – it was about a sense that, for me, it might be time to leave the past behind and move into a different future. One where the Troubles frame a backdrop to our lives, not a central focus. And so it is in Inish Carraig. There are references to the (now-destroyed) Peace Walls. There is a riot that harks back to Belfast in the news of my youth (but, hey, the world has just fallen apart and people aren’t happy.) But it’s mostly a book about people. Inish Carraig wasn’t written just for an adult audience. Far from it: the main protagonist is a 16 year old boy living in a roofless house on the destroyed streets of Belfast . His 13 year old sister carries much of the storyline as does a policeman in his thirties. And, frankly, to the generation coming towards voting age, the Troubles are a part of their history. It’s not the Northern Ireland that they have grown up in. I wanted, very much, to reflect the modern country. I also wanted to showcase something of the people and its land (and I go further with that theme in my next book, a fairy-fuelled roadtrip through the Antrim Glens). I wanted to capture the humour that carried Northern Ireland through dark days. (That does rather have the effect of some people getting it and loving the dark asides, and some reviewers missing the humour altogether, but that’s the risk I took). I wanted the book to feel like it couldn’t be transplanted to any other city or country in the world and feel the same. Which is why, when John stands at Ballycastle Harbour, waiting to be transported to the alien prison of the title, he sees the sea as a moving slab of grey rock – the true North Atlantic in winter, not the picture-blue of the postcards. I sell the book on a worldwide platform. It’s available in Australia, in India, in France and America, and beyond. I did wonder how well it would translate – and have been pleasantly surprised at the reception. Indeed, it’s become something of a cult gem – getting rave reviews but with people not entirely sure what it’s about at first. The title is exotic for science fiction, the focus of the story not quite clear. It is, in essence, a human story of a boy from Northern Ireland, surviving the loss of his world as best he can, and a man looking for redemption for what his past has led him to do. It’s a universal story, a fast pacey tale in a Northern Irish voice. It is of the place and about the place and not bogged down in history. And that seems to be what makes the book popular across the world – because people like to read about real places and real-feeling people. They want to be transported into a world they feel they could visit and imagine. Even in fantasy and science fiction, the worlds that feel most real, and most vivid and alive, are the ones that pull us in. All of which means that Inish Carraig is pretty much the book I hoped to write. And that is all any writer can really hope for – to take their land and carry it to others and portray it as well as they can. It’s the same in every genre – and each genre can bring its own flavour back to the place it emerged from. I hope, with my tale of aliens, I’ve added something to the literature of the country. If not, I hope I at least created a good read. Jo Zebedee is the author of the Abendau books (a space opera series), Inish Carraig (an alien invasion novel, and Waters and the Wild (a fantasy and/or psychological thriller).